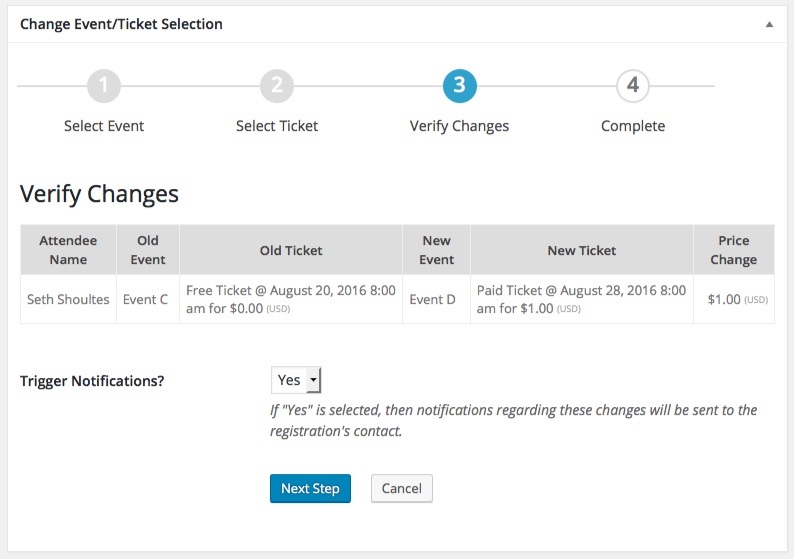 The Attendee Mover for Event Espresso 4 makes it easy as possible to move registrations between events. Need to Buy a Support License for the Attendee Mover add-on for Event Espresso 4? This add-on requires Event Espresso 4.9.13 or newer. It cannot be used with older versions of Event Espresso 4. You download the latest version of the Attendee Mover add-on from your Event Espresso account. A new admin menu will not appear for this add-on. It can be accessed by going to Event Espresso –> Registrations. Then look in the Actions column which appears in the far right area of the screen and look for the multiple arrow symbol (see image in the section for example). Moving an attendee to a different event/ticket is easy and only takes four simple steps to move an attendee to a new event. From the Registrations Overview page, click the “Attendee Mover” icon in the attendee row. Choose the event that you would like to move the selected attendee to. Select a ticket and click the “Next Step” button. After the attendee is reassigned to the correct event/ticket, set the “Trigger Notifications” option to your desired setting. Then click “Next Step” button. Now your attendee should be reassigned to the new event/ticket, where you can see a record of the reassignment. Please first check that you have Event Espresso version 4.9.7 or greater installed. then uncheck the box next to Filter Long URL Strings, then click Save Settings. The WordPress REST API must be enabled in order to use the Attendee Mover. Older versions of WordPress did not include the REST API. So if you have an older version of WordPress you can update to its latest version. Also, the REST API can be deactivated with plugins. If you’re unsure if the REST API is activated on your website, you can use the Health Check plugin to verify. Our support team cannot write custom code for you.